The Battalion was withdrawn on the 15th July, and marched back to Laventie, where preparations were begun for the attack which eventually took place on the 19th July, after being postponed from the 17th. The object in view by the Division was to render assistance to the operations on the Somme by preventing the withdrawal of German troops from this sector as reinforcements. to Sugar Loaf salients; two Battalions from each Brigade were detailed for this attack, the remaining two being in support. Of the 184th Brigade the Royal Berks were detailed for the right, the Bucks for the left of the attack. The 183rd Brigade were on the right of the Royal Berks, the Australians on the left of the Bucks, but owing to the salient unable to keep in touch. Battalion Headquarters were at a farm in front of Picantin Post, between that post and Jocks Lodge. and moved up during the attack to positions in front of Bacquerot Street and to some strong posts in the vicinity. The formation of dumps of S.AA., rations, water, engineer stores, etc., necessitated heavy fatigue work for days beforehand, and even the troops detailed for the attack were not exempt up to the last moment. The preliminary bombardment, which lasted for three days, was carried out by some 350 guns of all calibres, R.F.A. and R.H.A. Batteries being pushed up to within a short distance of Tilleloy Street, many of them in exposed positions, where they suffered heavy casualties. On the afternoon of the 19th “lifts to barrage lines “were ordered for the Artillery for certain periods, varying from four to ten minutes, during which the Infantry in the trenches were to show their bayonets and steel helmets over the parapets, and officers were to whistle and shout orders with the view of inducing the enemy to man his parapet and thereby incur heavy casualties when the Artillery shortened the range on to the front parapet and continued the intense bombardment of the front and support lines. During the last phase of the bombardment the attacking Infantry was to issue through the sally posts cut in their wire and deploy in No Man’s Land in four waves, the leading wave within 8o yards of the enemy’s parapet, if possible, and 50 yards between waves. The assault was timed for 6 p.m. In the Battalion “A” Company under Captain H. Church and “D” under Captain I. Stewart-Liberty were detailed for the attack. On the 18th “A” Company had lost 78 men owing to a short shell from one of our own guns falling on a gas cylinder and bursting it in the trench. This had necessitated filling up the ranks of the Company with men from the reserve and from a newly arrived draft, but it was still much under strength. On the 19th owing to the restricted front and consequent crowding in the trenches, the casualties were very heavy, amounting to nearly 100 killed and wounded before the Companies moved out to deploy for the assault. Luckily, it was not necessary to use the sally posts, which in the case of other units caused heavy losses at the start, as they had been located by the enemy, and were effectively covered by machine-gun fire. into No Man’s Land by way of Rhondda Sap and lay down in four waves. In order to complete the waves “C” Company had followed “A” and “D “and “B” Company moved in to hold and garrison the line. By 6.30 p.m. it was evident that the attack had failed, but it has been asserted that success could have been secured had it been possible to bring two freshCompanies to the assault. 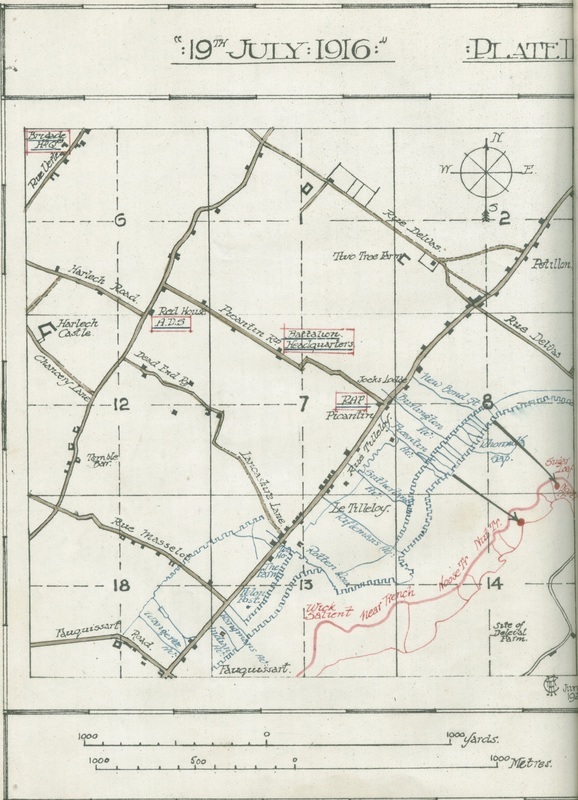 No reserves, however, were available; “B” Company was fairly intact, but definitely marked for garrison duty in the line—a few orderlies, telephone operators, etc., were with Headquarters, and the small remnant of the assaulting Companies who survived were in No Man’s Land awaiting darkness to get back. All the officers of the three Companies that had gone out were either killed or wounded except one. The position was reported to the Brigade Headquarters, and orders received toreorganise and attack again at 8.30 p.m. Reorganisation was effected so far aspossible by taking 40 men from” B” Company and collecting about 8o more fromthe other Companies. As soon as this had been carried out, orders were receivedfirst postponing and finally cancelling the fresh attack. Incidentally the enemy incurred heavy casualties, though not nearly so heavy as was calculated during the progress of the bombardment. Their line was lightly held by Infantry, great reliance being placed on their numerous and well-trained machine-gun teams, their bomb-proof shelters were efficient, and they persistently declined to be misled by the appearances of imminent attack stage-managed for their benefit. Yet at the moment of the real attack they were all there: and from the action of their machine-gun teams it would seem that their Intelligence officers had “inferred “Zero with considerable accuracy. The casualties in the Battalion, which had gone into action with 20 officers and 622 other ranks, were 322 of all ranks during the 18th and 19th July. KILLED 4 Officers And 62 other ranks. WOUNDED 8 Officers And 180 other ranks. MISSING (all believed killed) 2 Officers And 65 other ranks. At 1 a.m. on the 20th the Battalion, on relief by the 2/4th ‘Oxfords, withdrew to its billets near Laventie, and at 10 a.m. was conveyed by motorbus to Estaires. “ZERO”was at 11a.m. & at that hour our Bombardment started. By 5. 30PM - we had lost nearly 100 men killed and wounded by Shell Fire. This was serious as on July 18th “A” Coy. (which was holding the Battn. front) lost 78 men gassed –owing to one of OUR shells having burst a Gas Cylinder in our Trenches. 5.40PM-What was left of “A” and “D” Coy’s. (the assaulting Coy’s.) – about 120 men filed out into NO MANS LAND by RHONNDA SAP and lay down in 4 waves. Quite early (about 1.00 pm) telephone communication between Battalion HQ and the front line was cut. After many gallant attempts to mend the wire, success was attained at exactly 5.40 pm, and from then until 9.30 pm the telephone was in constant use thus saving many lives, in that runners were spared. Reports that flowed in over the telephone were sent on, as they came in, straight to Brigade HQ, and were very contradictory. Owing to the distance between the trenches, and to the continuous bombardment and smoke, the officers who were observing found their task almost impossible to fulfil with any degree of accuracy. Our men, having been seen actually on the German parapet, it was concluded that a certain number must have got in. But it is certain that very few survived the enemy's machine gun fire, and whether they got in or not, they never returned”. 7.30PM– The order then came to postpone the attack until 9PM. During the 18th and 19th July the Battalion lost 322 ALL RANKS –as follows. – though penetrated– were not consolidated and held. 11AM- The Battn. went by Motor Bus into Billets at ESTAIRES. The Battalion was inspected by Major Gen. Colin MACKENZIE C.B. G.O.C. 61 Div. MAJOR L.L.C. BARRETT & CAPT. H.S.G. BUCKMASTER were invalided Home to England. Thus all four Coy. commanders have gone.